Dr. Mundo regenerates 0.3% of his max health each second. I would've hated to see the game back on Oct. 6th, 2010. Mundo not a tank? What? Mundo's more of a tank than almost any other champ. 996275 IcyAuron I would've hated to see the game back on Oct. 6th, 2010. Mundo not a tank? What? Mundo's more of a tank than almost any other champ. Really useful passive, that allow Mundo be a nice tank. More better, that Garen Passive, because Garen regen out-combat. Mundo healed always. 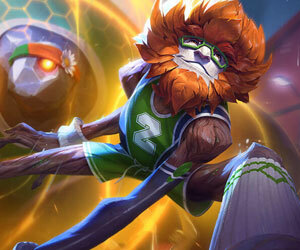 With Mundo Ult, Spirit Visage, Force of nature, Warmog, we will recieve very big HP regen. 515256 TwitcherBrain Really useful passive, that allow Mundo be a nice tank. More better, that Garen Passive, because Garen regen out-combat. Mundo healed always. With Mundo Ult, Spirit Visage, Force of nature, Warmog, we will recieve very big HP regen. You shouldn't underestimate it. Include Spirit Visage, and it will become higher. It also fits Mundo extremely well, since his major thing is hp-regen. About building Mundo as a tank, he is extremely nice as OT (or even MT) and you don't build him as a tank because of the passive, but because of his ability to hurt a lot even without having a lot of gear that increases AD. 55669 Mastarwe You shouldn't underestimate it. Include Spirit Visage, and it will become higher. It also fits Mundo extremely well, since his major thing is hp-regen. About building Mundo as a tank, he is extremely nice as OT (or even MT) and you don't build him as a tank because of the passive, but because of his ability to hurt a lot even without having a lot of gear that increases AD.